we went on the Web in 1995. Do NOT use this page to further access the site. The Nogales, Arizona High School Mariachi Band! Bueno! Get the Tuning and Repair CD FREE with a $200 order! Check out our page of instructions. Our offerings are targeted at the do-it-yourselfer AND the professional. bench hardware. Many items ship in one to two days. using our Toll Free phone number. This is serious instruction. Steve Van Nattan is available to tune pianos. This is an exclusive feature-- On the CD only. We help a lot of friends who cannot get help anywhere else. Learn what you need BEFORE you order-- Get price quotes. We try to answer your mail the next day. This CD contains the whole book on Piano Repair and Tuning, including exclusive Piano Tuning Software. Read more about the CD. 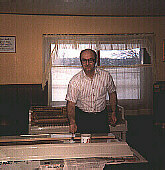 Piano Bench Maker in the United States. Finally, Piano Lamps! Also, Round Top Stools. Much more from Jansen. Old joke-- "You can tune a piano, but you can't tune a fish." My answer-- "True, but I can scale it." PIANO OWNER'S SURVIVAL GUIDE- piano, pianos, repair, supplies, supply, parts, catalog, piano, piano, piano, tuning, tuner, regulation, repair, guild, technician, parts, piano parts, restore, and tune your piano. Order piano parts and tools. Some piano tuners send customers to us. Save hundreds of dollars. This is the only book of its kind anywhere. Our Classified Page will help you to buy and sell musical instruments. Note these words: Piano, Piano Owner's Survival Guide, The book most hated by Piano Tuners, do-it-yourself piano repair, piano restoration, piano tuning, Piano repair, catalogue, catalog, tuning, tuner, tune, music, Baldwin, Kimball, Steinway, Mason & Hamlin, Yamaha, piano, organ, Kawai, Samick, Young Chang, tone, musical, instruments, standard pitch, lowery, wurlitzer, organ, bach, beethoven, chopin, Van Nattan, horowitz, concert, music department, keys, notes, note, key, temperament, pitch, sound board, upright, grand, spinet, console, music teachers, Piano Exchange, Schaff, Petrof, bench, Steve Van Nattan, survival guide, self-help, do-it-yourself.